Charlton Hestons Gun Vault and Gun Collection -- if you can't go first class -- stay at home !! the chairs dont match the couch. thats tacky. id pass. Tell me, what does this have to do with boating? Take it to Dockside chat. Thanks for posting. This is cool. Pretty awesome collection. I love the M2A1-7 United States Army Flame Thrower on the wall. My personal fav. hey, the OMEGA MAN was ready for the Planet of the Apes. 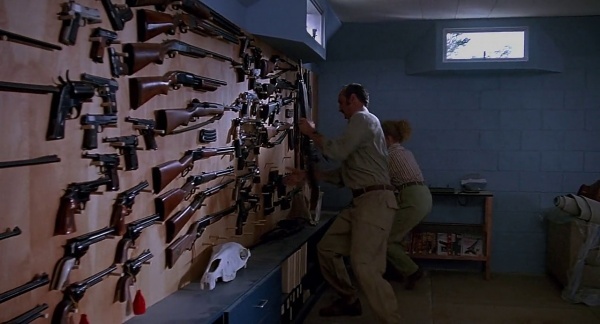 Sure beats Burt's "Wall of Death"
that's going to be A LOT of "cold, dead hands..."
Out of curiosity.. does anybody knows in which state is that collection located? In that first pic, would that be a shooting range? That's exactly what I thought ! Without busting any bubbles here, it's supposedly the collection of Bruce Stern, a Connecticut lawyer. But still very cool. Those pics are very very old and if I'm correct back then it was said not to be Charlton Hestons gun collection. No guns are allowed in that DB city run by that DB mayor, Occupiers and Teachers Goonions.